Here is a great fuzz pedal similar to the Rockett WTF (which Paul also designed). A couple of capacitors are unknown. You need to test different values (shouldn't be too difficult to find the correct ones). Schematic and original FSB thread are available here. 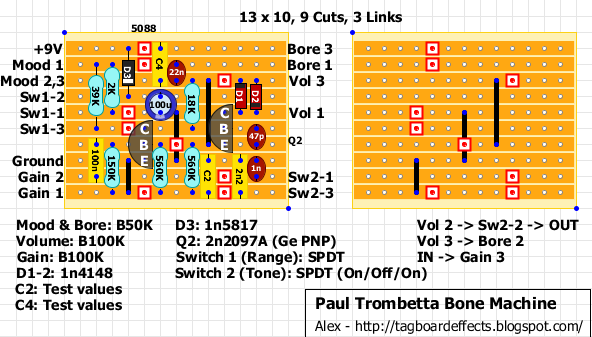 I've added a second layout with the new extra switch but it's all guesswork. Anyone know where to get 2n2097a? There's some confusion on that type of transistor. You can try to build the Si/Ge switch layout if you want and test other PNP germanium and silicon transistors. On the gutshot you can read 187 on the top of the 2907. That could possibly be the Hfe. Hi guys, what is meant with the 'test values'? The value of those capacitors are not known. So it would be best to socket different values till you find something you like. Verified version 2 last night! Works like a charm, every switch does what it needs to do. 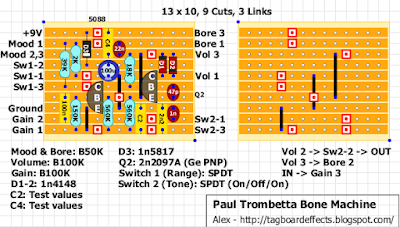 Huge range of sounds to be had, from allout fuzz to velcro sounds to ringmod with the bore knob way up. I used a 22n for C2, as that's what is in the WTF at that point and a 220n for C4 cause I likes low-end :). For transistors I used a 2N2907 Si PNP and a MP20B Ge, both sound good to my ears, the MP20 has a little less volume. Maybe I'll play around with the Hfes some more. Thanks to Alex for the layout!! Just built this as well. Used 22nf and 220nf as suggested above. Works well. Anything below 220nf would not produce horn or sub bass sounds. Seems you need lots of low frequencies to pass though there. Highest PNP I had was 160hfe. Worked just fine. Tried another one at 115hfe, out of curiosity. Sounded terrible. 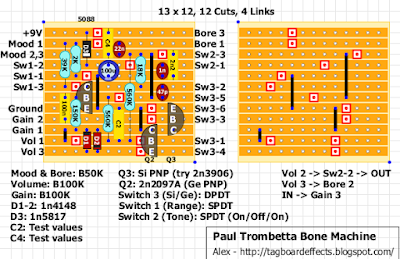 Low gain, thin, and way too gated. So I bet that "187" marking on the original was for hfe. What is Q1? 2n 5088? thanks! It's written on the top of the board. woah 1:16 starting those trumpet tones. never heard that kind of tone before! Just finished version 2 of this and it is glorious. For the germanium side I used an AC122 with hfe between 170-180 from musikding.de. Everything else as suggested in the comments above. The germanium has a little less gain, but I actually prefer that. Hi!Just finished the pedal but if i switch sw1 it just cuts the sound.the same happens if i turn the mood pot.it only works with the mood all the way down.If i take the ac122 out it plays ok (no germanium though).Whats wrong?Can anyone help?